Join us for a public reception for False Flag: The Space Between Paranoia on November 3 from 5-8pm with a 30-minute artist & curator walkthrough. The exhibition is curated by New Haven based artist Jeff Ostergren and is on view from September 22, 2018 – January 6, 2019. 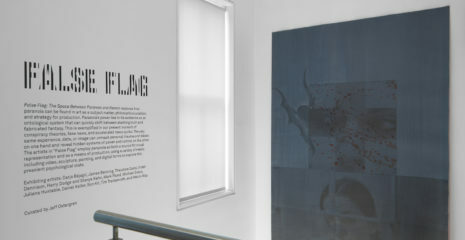 False Flag is a group exhibition that investigates the continuum of paranoia, as subject matter, philosophical position, and psychological state. Videos, sculptures, paintings, and photographs utilize paranoia as a visual representation and a means of production. The works and the way they are installed produce a kind of looping paranoid state of multiple voices, perspectives, and possibilities, leaving the viewer to establish their own position within this continuum. Exhibiting artists include Darja Bajagić, James Benning, Theodore Darst, Violet Dennison, Mark Flood, Juliana Huxtable, Stanya Kahn and Harry Dodge, Daniel Keller, Tim Trantenroth, and Melvin Way. In contemporary contexts, the term false flag is used to describe a situation where a segment of the population believes that the government, seeking to increase their power or to push through specific agendas, has staged a traumatic event – such as a mass shooting or terrorist attack – and pinned the blame on an individual or terrorist cell. Often called out to stomach-churning effect by the so-called “alt-right media,” the false flag nonetheless contains a fascinating and complex system of logic. The obsession with the False Flag allows the paranoiac to always think they are correct, no matter the response. If there is a secret conspiracy and it happens to be revealed, they would be right, and the paranoia becomes an understanding of hidden methods of control (for instance, the NSA spying on Americans). But when such allegations are denied, it is seen as a cover-up act by what is often called the Deep State. Deniers of the Holocaust, 9/11, or the Sandy Hook shooting, for example, are part of this shocking, often hurtful end of the continuum. Image:Still from Theodore Darst, The Tourist: This Machine Makes Fascists (Soundtrack by Kevin Carey), 2017. 11 minute HD Video loop, cargo straps, mounting equipment, Dimensions Variable. Edition of 3 + 2 artist proofs.